This is Vietnamese Pop. I can't get a date on it, but I'm guessing around 1975 [Correction: early 80's]. Help appreciated. These songs were composed after the fall of saigon (1975) . I don't know them at all . 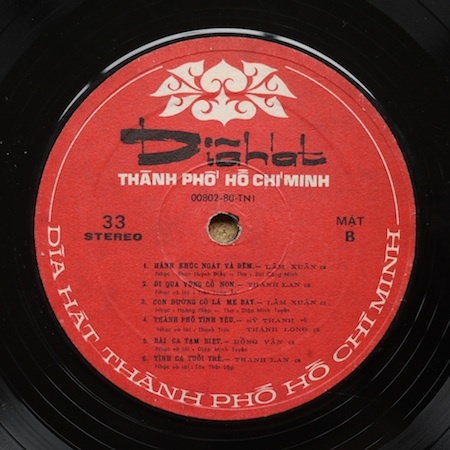 Contemporary Vietnamese popular music is a diverse genre that reflects several combinations of ancient, modern, Vietnamese regional differences, and foreign influenced concepts borne from the effects of forced and/or voluntary migration, inter-racial unions due to a myriad of historical events occurred throughout several centuries in Viet Nam. 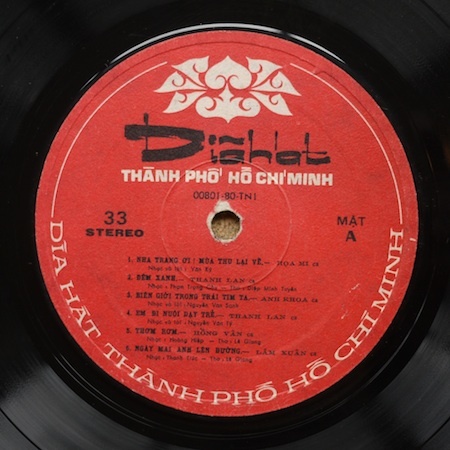 It would be disingenuous to box contemporary popular Vietnamese music into one convenient category without considering Vietnamese ethnic and cultural differences that existed over time. The Vietnamese inherently cultural and ethnic differences woven with foreign influences that produced a variety of popular music. Vietnamese migration and/or travelling to all corners of the world began well over a century ago. Music was and still is the common vein that runs through all Vietnamese people regardless of their nationalities, ethnic mixtures and, background. What is considered as Vietnamese music had survived acculturation during the one thousand years rule under Chinese occupation followed by one hundred years of French colonial rule. Thanh Lan (1948 - ) là một ca sĩ, diễn viên Việt Nam nổi tiếng. Cô là một trong những nghệ sĩ hiếm hoi thành công trên cả ba lĩnh vực âm nhạc,điện ảnh và sân khấu. Ca sĩ Thanh Lan, nổi tiếng với các ca khúc Pháp, là một trong những gương mặt tiêu biểu cho thời kỳ đầu của nhạc trẻ ởSài Gòn. Với điện ảnh, cô đã tham gia nhiều bộ phim nổi tiếng như Tiếng hát học trò, Ván bài lật ngửa. This is a really interesting audio document. 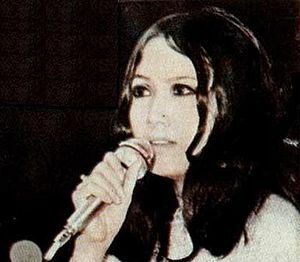 The songs feature a few singers from the pre-1975 Saigon regime and the arrangements are much lighter than the usual dry, serious Communist fare. A couple of songs were written for the 1979 border war with China. Thanks for making this available.